While SEAOI encourages any meaningful volunteer activity, the following is a list of events that SEAOI supports. Contact us to get involved with any of these events! 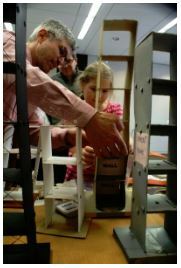 SEAOI is urgently looking for volunteers to build models in the next three weeks to use at events promoting awareness of structural engineering among school-age children. 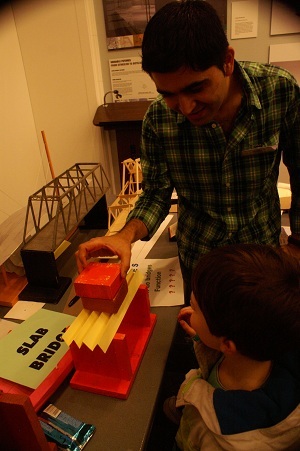 Using hands-on, interactive models is a fun and effective way to present structural engineering concepts and systems to young students, their parents, and the general public that attend these type of events. While allowing for interactive exploration, some models are very simple, others are more complex. As we expand our library of models, we are looking for volunteers to create new models or recreate and enhance some of the existing models that we have used over the years. These models are the centerpiece of our engagement with the students and a means to spark their imagination and curiosity while providing tidbits of education. Anyone with an interest in assisting should contact the SEAOI office. This competition takes place each January and requires volunteers to serve as judges and engineer mentors. Future City Competition serves students in 6th, 7th and 8th grade. Sponsored by National Engineers Week, this national program introduces students to engineering with the popular Sim City software. Students design future cities with simulation software, build scale models, write essays and give oral presentations on their city's design. The theme for the 2018-19 Competition is "Powering Our Future" where students will be challenged to design a city to have electrical power stay on during a cataclysmic event. The 2019 Regional Finals take place on January 19, 2019 at Whitney Young High School, 211 South Laflin, Chicago, IL 60607. Due to the extreme cold, the Annual IIT Bridge Competition will take place in the Herman Hall Auditorium in February 12, 2019. Please visit the IIT website for more information. The International Bridge Competition will take place on April 6, 2019. This event takes place in February and requires 6 to 8 volunteers. For more information, please visit the Chicago Architecture Foundation website. This event takes place in February and requires 6 to 8 volunteers. This free event is part of National Engineers Week, and is designed to introduce children of all ages to the field of engineering. The building will be full of hands-on activities and demonstrations to allow young people to experience and explore the engineering field. SEAOI is a sponsor of this event and will have three display tables. In previous years, SEAOI volunteers have presented lectures to standing room only crowds. The next exhibit will take place on February 23, 2019. Learn more on the IIT website. This event takes place each May and the requirement for judges and other volunteers varies. Visit the Illinois Junior Academy of Science for more information. This event takes place in June and requires 5 volunteers. Chicago high school students are invited to the museum to learn about careers in the STEM fields.